"I love Dutch work culture - they are all about getting the job done." When you meet Indian student Chayan (ChiChi) Taldar he does not look like he has a care in the world. Full of humour with lots of friends, he works part-time as a bartender in Apeldoorn and comes from a family of hoteliers. 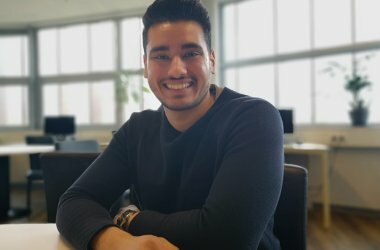 What most people don’t know about Chayan is that he was diagnosed with Diabetes Type 1 when he was a 12-year old boy, yet he has not allowed that to stop him from studying abroad in the Netherlands and from living a full, active life. Take for instance last summer. While most students were enjoying the holidays, Chayan used the time off to train as a bartender at the European Bartender School in Greece. That allowed him to find a job at De Professor, a bar in Apeldoorn. In fact, he has also worked here as a chef, a dish washer, and runs his own business trading in precious stones. In addition, he is a member of Wittenborg's student organisation SWIFT. Diabetes Type 1 causes the level of glucose (sugar) in your blood to become too high. It happens when your body cannot produce enough insulin, which controls blood glucose. You need daily injections of insulin to keep your blood glucose levels under control. Chayan joined Wittenborg University of Applied Sciences in 2016 and is about to enter Phase 3 of the IBA in Marketing & Communication programme. He had another setback three weeks ago when his sister, with whom he had a close bond, died unexpectedly and he missed out on exams. He still gets emotional talking about that period. He enjoys studying in the Netherlands and is intent on opening a hotel in Amsterdam after his studies. “My family has three hotels in India.” Does that mean he had a spoilt upbringing? “No, not at all. My family built their business from nothing, so I know good as well as bad times, as well as what it means to be hard working. “I identify with the Dutch work culture. They are all about getting the job done.” And as a bartender, what is the favourite drink of the Dutch? "Oh, gin and tonic. Definitely."